Witchery is a leading Australian-based retail chain specialising in men’s, women’s and children’s clothing, shoes and accessories. 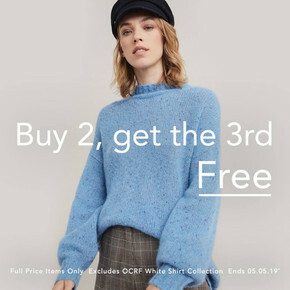 Shop Witchery online to browse the latest catalogues and weekly ads for the best deals and special offers. Shop online at Witchery and become a member to receive great rewards as you shop. Benefits include a $15 reward when you spend $150, a $35 reward when you spend $250, and a $100 reward when you spend $500! Other offers include fast delivery, in-store returns, free shipping on orders over $200, and a $20 reward on your birthday! Spend over $1000 in a year to become a Witchery Silver Status member. You’ll get $100 when you reach $1000, exclusive event invitations, and more! Shop at Witchery for even more ways to shop! Can’t find your size or colour in store? Witchery will find it for you and deliver it free of charge to your front door. With Click & Collect, have your online purchase delivered to your local Witchery store, where it will be available for collection within a day! For up-to-date information on store locations, opening hours, and to browse the latest flyer, visit Shopfully website or download the app.